How do you get more people to eat their greens? 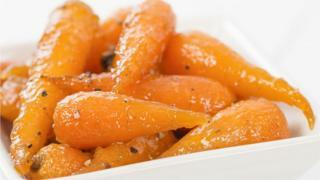 Give vegetables seductive names, say US researchers. A team at Stanford tried it out on students in the university cafeteria and found veggie sales went up by 25% when indulgent labels were used. “Sizzlin’ beans”, “dynamite beets” and “twisted citrus-glazed carrots” tempted diners to fill their plates. Healthy labels, such as “wholesome”, were a turn-off, even though the dishes were identical in every other way. The choice of vegetable – beetroot, butternut squash, carrot, corn, courgette, green beans, sweet potato – was also rotated to make sure there was enough variety throughout the week. Each day, the scientists counted how many of the 600 or so diners selected the vegetable dish and, at the end of the meal time, weighed how much of the food had been taken from the serving bowl. The indulgent labels came out top and included “twisted garlic-ginger butternut squash wedges” and “dynamite chilli and tangy lime-seasoned beets”. Seductive names resulted in 25% more people selecting the vegetable compared with basic labelling, 41% more people than the healthy restrictive labelling and 35% more people than the healthy positive labelling. Could this trick make you like your vegetables more? The researchers, Brad Turnwald and colleagues, say the findings, published in JAMA Internal Medicine, make sense when you consider the psychology behind food choices. “When most people are making a dining decision, they are motivated by taste. “And studies show that people tend to think of healthier options as less tasty for some reason. “Labels really can influence our sensory experience, affecting how tasty and filling we think food will be. Although most of us know that we should eat plenty of veg, too few of us do it. People are advised to eat at least five portions of fruit and vegetables per day. Roughly a quarter of UK adults actually achieve this, however. Prof Heather Hartwell from Bournemouth University in the UK has been leading a European project, VeggieEAT, designed to get people eating more veg. She says no one strategy works for all, but there are lots of ways to boost intake. For some, selecting healthy food is a considered and conscious choice. But Prof Hartwell is also an advocate of “health by stealth” – nudging people in the right direction. For example, putting a picture of tasty looking fruit on supermarket trolleys could help “nudge” consumers to select more produce from the fruit aisle, she said. Some consumers might buy something “gourmet and healthy” – such as spiralised courgette noodles – simply to impress their friends, she said.